Did you ever notice how Tony Stark, aka Iron Man, kept upping the technology ante with each regurgitating sequel? What began with a car battery and electromagnet rapidly progressed into self-assembling iron suits courtesy his artificially intelligent robot, Pepper, oops sorry, Jarvis. Now, however, robots are no longer part of simply cinematic fantasy or weird Japanese dogs. 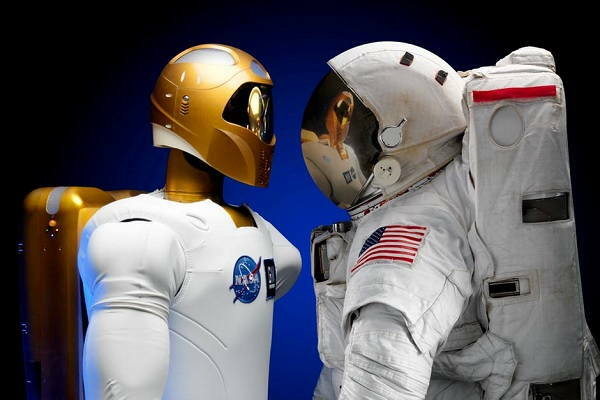 They have been evolving into automated, artificially intelligent, workers, often with frightening capabilities. But why are we suddenly concerned about these machines? Let’s roll back a century and think about the progress that took over the western world in the 1900s, the Industrial Revolution. It came about with a bang and made cloth makers, blacksmiths, and all those skilled handy tradesmen irrelevant with the dawn of mammoth looking machines, churning out product after product in record time. Fast forward a hundred some years, and we are now on the verge of facing the question – Are we going to lose our jobs to robots? Let’s address this – Should we be paranoid about robots taking our jobs? And if so, what can we do to salvage the situation? As is with many issues, there are almost always at least two schools of thought with their respective experts battling out the details. In this case, while some experts believe that the situation is wrinkle-worthy, others feel that employment trends have a way of plateauing out the fluctuations. Without taking sides, we are going to lay down the observations and speculations offered by each. Let us know what you concur. While the production and manufacturing industry is not unfamiliar with the impact of robotisation, as has been happening over the past few decades, and more, there is a rather new revolution that is taking over in the more recent past. The advancements in Machine Learning and the low cost of data storage has made way into more advanced, thinking avenues of technology that uses data, can recognise patterns, and is, or at the least will, be able to possess intuition and judgement. Think about the self-driven cars and their scary sensors, with skills very few human drivers seem to possess. In 2013, in a working paper released by the Oxford Martin School of the University of Oxford, titled the Future of Employment, the researchers studied the susceptibility of jobs to computerisation. Their mathematical wizardry dived into the patterns and expected impacts on the US labour market. According to their estimate, 47% of total US employment is in high risk of being shoved over by the Tin Man. Further evidence to this has been corroborated by the observation of MIT professor Erik Brynjolfsson and his collaborator Andrew McAfee. 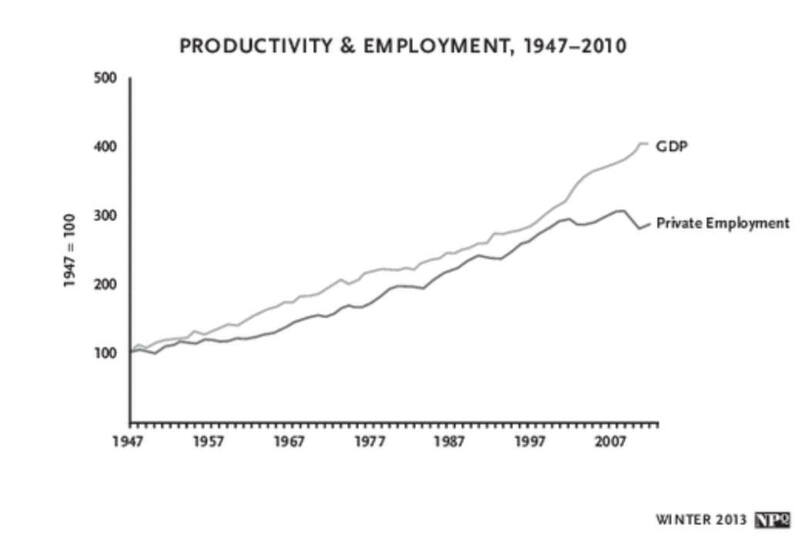 The co-authors of Race Against the Machine like to show the following graph to assert their argument about the potential power of computer technology to overthrow employment growth. This graph, drawn by economist, Jared Bernstein, shows the evolution of productivity and employment over, say, the past 60 years. What is a consistent tag-teaming of the two parameters, rising in tandem, there seems to be a strange widening around the 2000s, about the time computers reached the work market in a big way. This has been termed the Great Decoupling. A detailed discussion is available in this article on MIT Technology Review. What does this imply? That though productivity, and consequently GDP, is on the rise, the employment numbers are not rising as rapidly. This indicates a possibility of technological intervention, in place of human labour force. That is, yes there is economic development but most likely caused by technology and automation, and not so much by employees, by the number. Read Should IT industry workers be scared of losing their jobs? On the other side of this argument, other experts seem to believe that while it is possible that technology is a factor in slugging down employment, it is also possible that recent economic crisis and other factors have a large role to play in the slowdown, as well. They contend that with technological advances, certain jobs may have or will become obsolete, but there are other jobs that will most likely open up in their place. A shift of paradigm if you will. But such a shift will not go unnoticed and without casualties. For instance, the very high-skilled workers who, say, are able to keep up with the advances and are able to utilise the market to create new jobs or technologies will still find employment. So will low-skilled workers who are employed for their manual capabilities, such as health aid workers, etc. However, the class of workers that might get displaced the most will be the middle-skilled workers whose job can be easily automated. Already, technical support jobs are being automated. As are other clerical and repetitive jobs that a large section of the US labour has been employed in. Very recently, as recent as in 2018, Northeastern University and Gallup released a report called Optimism and Anxiety: Views on the impact of Artificial Intelligence (AI) and Higher Education’s Response. It was based on a survey conducted in the USA in 2017, among over 3,000 adults. In their survey results they conclude a rather optimistic attitude towards the whole debate. Although 76% Americans agree that AI will have a strong influence in the way people work, 77% among the ones who agree, also agree that the change will be positive. The ones who are particularly worried though, are the blue-collared workers who feel their jobs are more vulnerable to job loss over automation. Not surprisingly though, most people, though worried, to semi­ worried, feel that their jobs will remain immune to changes. Perhaps due from a natural reliance on the nature of their jobs and an understanding of what kind of skills are required, whereas not completely being aware of what AI can potentially do. What is the remedy to save jobs in the face of automation? One word – skill upgrade and education. Well, okay, more than one word there but the sentiment is clear. If you want to keep your jobs and survive the onslaught of a sleekier, faster, and more trainable version of humans, aka robots, you will need to up your game and persistently aim for educating yourself to keep up with the times. The same study conducted by Northeastern measured the consciousness of US employees of a need to secure higher-skill education to secure a new or equivalent position. 51% agree that such a move is essential while the rest have faith in soft-skills and creativity to keep their jobs. While most expect their employers to step in and organize retraining programs, quite a few are of the opinion that on-the-job training and other avenues like online education can save them from lining up for a pink slip. So, at the end of the day, should you feel threatened by a new group of employees who need oiling or recharging breaks rather than lunch breaks? Probably yes. If not today, it may eventually come about in a few decades. On the other hand, it is also possible that such a technological revolution may increase productivity to the extent that more and more manpower is required to keep the who system moving forward, sustaining the then, and advancing for better performance. Question is, are you ready to accept the change and keep yourself technically and productively prepared? How to get hired after getting fired?